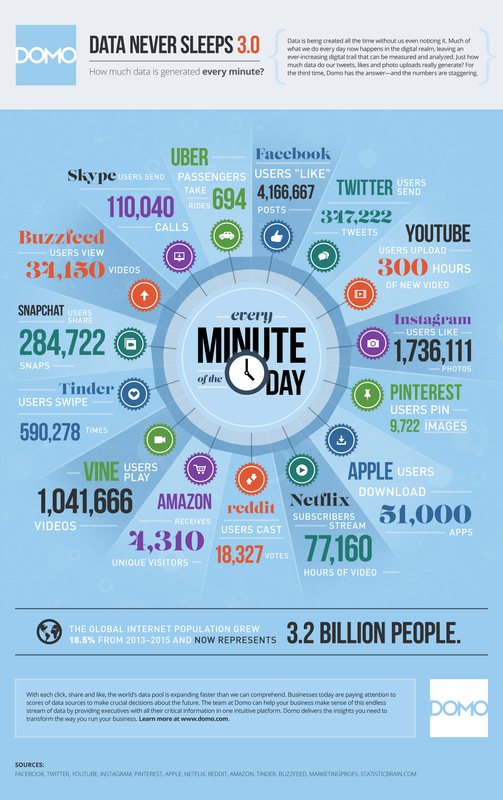 Nomo have created a great infographic which shows the amount of data generated every minute. It’s staggering. All that data. All around us. Useful to some. Useless to others. Some disguarded. Some safeguarded. Data is sometimes called the new oil. But it’s the engine you but the oil into that is important. And I think Ferris Bueller can help you with that. Data is now recognised as an asset in most businesses. The speed of data collected, the volume of data collected and the number of sources from which the data you hold is sourced is increasing every day. It’s not the size or speed of your data that is important, it’s the quality of the data you collect and how it can be used to support you to achieve your business objectives that’s important. All those 0000 and 1111 collected and converted into information. Meaningful for some, totally useless for others. Data collection is getting faster. Data volume is growing every day. The internet population is now over 3 billion people. DOMO have created an infographic outlining the volume of data collected every MINUTE. As well as the speed, volume and channels of data increasing. The rules of engagement keep changing, especially for marketing. If google changes an algorithm – how does that impact your customer acquisition? Do you disappear from the high street of search real estate? If Facebook changes it’s terms and conditions how does that impact the way you do things? Is it a ‘Like’ for your business or is it a ‘Poke’ to your customer engagement stats? In addition to this, your competitors are moving faster, your customers are more savvy and some big changes in data protection are on the way. To be successful you need to have an agile mentality, and dance your way to meet your business objectives. To quote the 1980’s philosopher, Ferris Bueller. Our focus at Websand is to help marketeers to get the most from the customer data that they collect everyday. If you want to get the most from the customer data you collect, we can help you to turn this information into customer engagement, increased brand loyalty and increased sales.